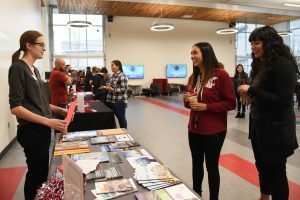 RICHLAND, Wash. – Student Maria Fernanda Vargas discovered her future career almost by accident after attending Washington State University Tri-Cities while still in high school. 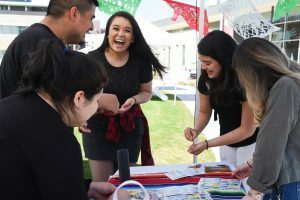 Maria Fernanda Vargas (center) celebrates while playing a game as part of a World Fair offered by student clubs at WSU Tri-Cities. 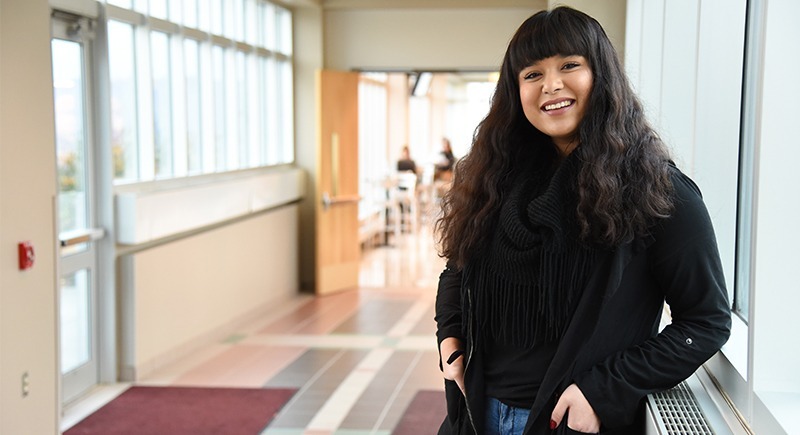 As a senior high school student in the running start program, Vargas was initially interested in nursing, but after performing an internship in the medical field and working in the GEAR UP program and as a student ambassador at WSU Tri-Cities, she realized her true calling lie in helping students achieve their full potential. As the first in her family to attend college, Vargas said she had a lot of questions about the college process and procedures where her parents weren’t able to help as much because they hadn’t been through it, themselves. But through the acceptance, help and support that she experienced as a student at WSU Tri-Cities, she was able to navigate the process successfully. “One day I hope to give back and make a difference for our future generations,” she said. As an education student, Vargas said she learned from professors who really take an interest in their students, working with them to make sure they are successful. The opportunities for networking at WSU Tri-Cities, she said, have also been huge. Maria Fernanda Vargas (right) talks with students and staff about international programming during a Preview Day for prospective students at WSU Tri-Cities. While Vargas is still young in her education program at WSU Tri-Cities, she said she looks forward to the practicum experiences that she will gain through the program. Through the experiences, Vargas will have the opportunity to work out in local school districts to receive real-world opportunities in the classroom. In addition to her studies, Vargas also works in the admissions office as a student ambassador and serves as part of the MEChA Club and the Compass Christian Club. She is also a member of the TRIO program, which provides academic and social support for students who are first-generation, economically disadvantaged or have a documented disability. Her involvement in various student and campus-led initiatives and programs, she said, has made for a wonderfully well-rounded student experience. After graduating the year after next, Vargas hopes to work for the Pasco School District, which is where she grew up going to school. She aims to become a math teacher working with middle school students or with second-grade students – possibly in a bilingual program.